“Severe Space Weather Events. Understanding Societal and Economic Impacts. A workshop report”. Space Studies Board. Division on Engineering and Physical Sciences. National Research Council of the National Academies, EE.UU., 2008. Presentación del Dr. Arthur Charo (Senior Program Officer, Space Studies Board, National Research Council) en el “2010 Space Weather Enterprise Forum”. Washington, 8 de junio de 2010. “National Space Weather Program advances on several fronts”. Gunzelman, M. y M.Babcock (2008). Space Weather Quarterly, volume 5, issue 4. American Geophysical Union. “El Sol, algo más que una estrella”. Manuel Vázquez Abeledo. 1ª.Ed. Sirius, 2004. “Solar and Heliospheric Origins of Space Weather Phenomena”. Jean-Pierre Rozelot. Springer, 2006. “The Sun and Space Weather“. A.Halnsmeier. Springer, 2007. “Forecasting Solar Cycle 24 using the relationship between cycle length and maximum sunspot number”. Watari, S. (2009). Space Weather Quarterly, volume 6, issue 1. American Geophysical Union. Presentación de Vickie Nadolski (Deputy Assistant Administrator for Weather Services and Deputy Director, National Weather Service, NOAA) en el “2010 Space Weather Enterprise Forum”. Washington, 8 de junio de 2010. Presentación del Col. Mark Zettlemoyer (Director of Weather, Headquarters, United States Air Force) en el “2010 Space Weather Enterprise Forum”. Washington, 8 de junio de 2010. “Space Weather & Telecommunications”. John M. Goodman. Springer, 2005. “Preparing for the upcoming solar maximum”. Tretkoff, E. (2009). Space Weather Quarterly, volume 6, issue 3. American Geophysical Union. “Space Weather. The physics behind a slogan”. K.Scherer, H.Fichtner, B.Heber y U.Mall. Springer, 2005. “Ionospheric scintillation effects on single frequency GPS”. R.A.Steenburgh et Al. (2008). Space Weather Quarterly, volume 5, issue 2. American Geophysical Union. Orden ITC/332/2010, de 12 de febrero, por la que se aprueba el cuadro nacional de atribución de frecuencias (CNAF). BOE núm 44, 19 de febrero de 2010. Presentación de Christopher J. Scolese (Associate Administrator, National Aeronautics and Space Administration) en el “2010 Space Weather Enterprise Forum”. Washington, 8 de junio de 2010. “Glossary of Solar-Terrestrial Terms”. Space Weather Prediction Center. NOAA. “Solar wind drivers of large scale geomagnetically induced currents during the solar cycle 23”. Huttunen, K. et Al. Space Weather Quarterly, volume 6, issue 1. American Geophysical Union. “Improved modeling of geomagnetically induced currents in the South African power network”. Chigomezyo, M. et Al. (2009). Space Weather Quarterly, volume 6, issue 2. American Geophysical Union. Presentación del Cap. Paul Stewart (Commanding Officer, Naval Research Laboratory, United States Navy) en el “2010 Space Weather Enterprise Forum”. Washington, 8 de junio de 2010. 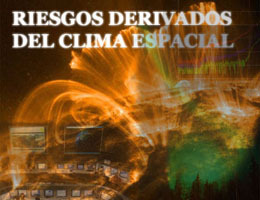 “Meteorología Espacial”. Sanahuja, B. (Departamento de Astronomía y Meteorología, Facultad de Física, Universidad de Barcelona). Revista Española de Física, vol.17, nº4 (2003). “Space weather in the FY 2009 U.S. federal budget request”. Kumar, M. (2008). Space Weather Quarterly, volume 5, issue 1. American Geophysical Union. “Proposed U.S. Space Weather Budget”. Showstack, R. (2009). Space Weather Quarterly, volume 6, issue 3. American Geophysical Union. “Renewed support dawns in Europe: An action to develop space weather products and services”. Belehaki, A et Al. (2009). Space Weather Quarterly, volume 6, issue 1. American Geophysical Union. Presentación de Juha-Pekka Luntama (Space Situational Awareness Programme, Space Weather Manager, European Space Agency, European Space Astronomy Centre, Madrid, Spain) en el “2010 Space Weather Enterprise Forum”. Washington, 8 de junio de 2010. “Space weather studies in Australia”. Wilkinson, P. (2009). Space Weather Quarterly, volume 6, issue 2. American Geophysical Union. “Under the lens: Investigating the Sun’s mysteries”. Harwood, W. e I.Klotz (2008). Space Weather Quarterly, volume 5, issue 4. American Geophysical Union.